Paddlepalooza Is Saturday, July 13, 2019! The staff and volunteers at the Chesapeake Bay Environmental Center (CBEC) are busy planning the big event! This is the 3rd annual Paddlepalooza hosted by CBEC. 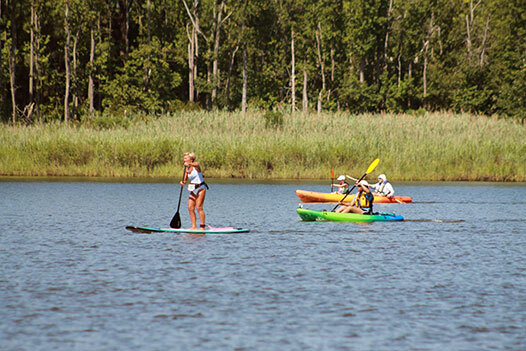 Paddlepalooza is a 3-mile safety-supported paddle (kayak, canoe, or stand up paddle board) circumnavigating CBEC’s peninsula to raise funds for the Kayak Wetland Education Programs at CBEC. Paddlepalooza is not a race, but a unique opportunity to experience the beauty of the wetlands surrounding CBEC as you paddle through the waters of Cabin Creek, Kent Narrows and Marshy Creek. The course is supported by safety kayakers and boaters. There will be a couple of areas where paddlers can pull-out if unable to complete the course. Following the paddle event, there will be a FUN party at CBEC’s Lakeside Pavillion from 10:30 a.m. until 3:00 p.m.! The party will include beer, entertainment, food for purchase and a themed basket raffle. All registered participants in Paddlepalooza receive an event T-shirt (NEW this year!) and a FREE Bottomless Beer Cup (age 21 and over with photo I.D.)! Spectators are welcome to cheer on the paddlers and join in the after-paddle party! Spectators (age 21 and over with photo I.D.) can purchase a Bottomless Beer Cup for $20 on the event day. Beer Truck will be on-site pouring Miller Lite, Blue Moon and 60 Minute Dogfish IPA. The CBEC website is open for registration! Take advantage of the early-bird special by visiting www.bayrestoration.org/paddlepalooza. Kayaks, Canoes, and Stand Up Paddle boards are allowed for the event. You may bring your own or rent from an on-site vendor. CBEC has a limited number of kayaks available for rent: $25 for non-CBEC members and CBEC members enjoy a FREE kayak. *Supplies are limited; reservations are required. To reserve a CBEC kayak, contact Karen Bogue, Paddlepalooza Coordinator at kbogue@bayrestoration.org. Paddle boards can be rented from Dragonfly Paddle and Fitness. Please contact Karla Horton at: karla@dragonflypaddleandfitness.com. New this year: The Holiday Inn Express at Kent Narrows will have a block of rooms at a discounted rate for Paddlepalooza participants! Come, stay, and make a weekend out of your paddling adventure! Call for availability and to book your room: 1-800-315-2621. Must mention Paddlepalooza at time of booking. Looking for ways to support this event and help raise additional money for CBEC’s Kayak Wetland Education Programs? Consider being a Paddlepalooza sponsor or donate needed materials! For event details, more information about becoming a sponsor, and/or to donate supplies, click HERE or contact Karen Bogue, Paddlepalooza Coordinator at kbogue@bayrestoration.org. CBEC reserves the right to cancel the event due to unsafe weather conditions, including but not limited to “small craft advisory.” The registration payment is non-refundable and is considered a donation. All proceeds benefit CBEC’s Environmental Education Kayaking Programs! Donation letters for tax purposes will be provided in this event.